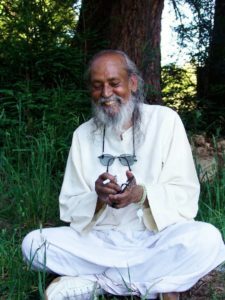 Affectionately known as Babaji, Baba Hari Dass is the inspiration for the Salt Spring Centre of Yoga. Babaji was a yogi and a quiet scholar who had remarkable skills in sculpture, music, architecture, yoga philosophy, writing and story-telling, and Indian cosmology. He was a leading exponent of Ayurveda, the ancient Indian science of health, an author, a monk, and was proficient in half a dozen languages. Baba Hari Dass came from a region of the Himalayas in India. He left home at the age of eight to join a renunciate sect in the jungles. He was a mauni sadhu, a monk who practices continual silence. He had not spoken since 1952 and communicated by means of a small whiteboard. The purpose was first to conserve energy, second to silence the mind, and third to develop non-attachment to desires. Babaji had the marvelous skill of conveying a great deal in the fewest possible written words. Until recently, Babaji spent several months each year at the Sri Ram Orphanage in northern India which he founded, and also made an annual visit to the Salt Spring Centre of Yoga. Babaji left his body on Tuesday September 25, 2018. His passing was peaceful, and he received loving attention and care throughout the final stages of his life. To read more about his life and legacy, please visit www.babaharidass.org. The best way to attain peace is through Karma Yoga. It serves two purposes. First it takes care of the world and second it creates non-attachment to the world.